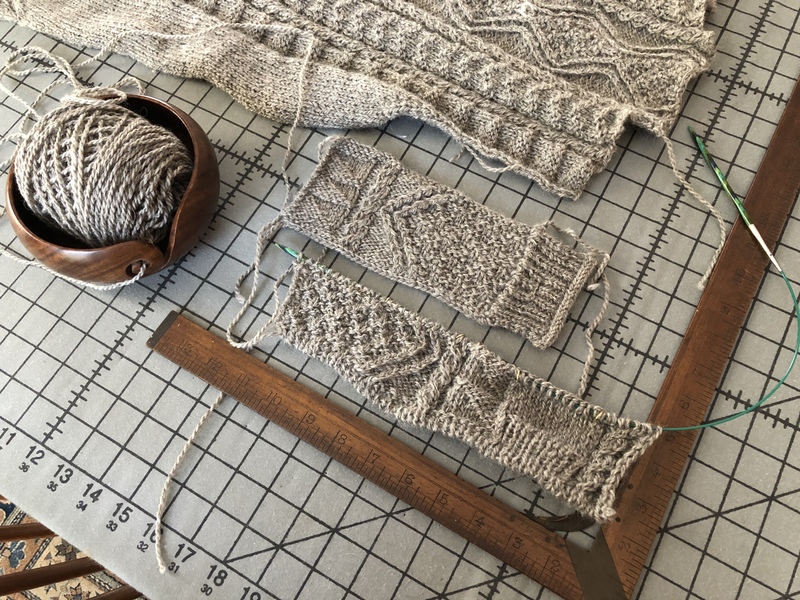 Lots and lots of ripping and re-knitting, both of the transition between the cuff and sleeve body pattern, and the sleeve caps (along with the saddles). It took a couple of tries before I felt I had a good match between the cap and the armhole, but I think I’m finally there — seaming will tell. 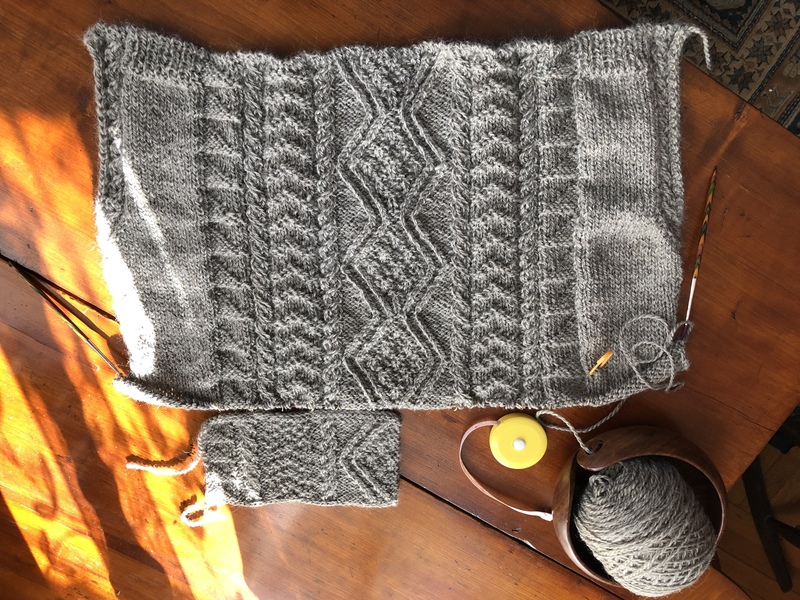 The textured panel along the center front compressed vertically relative to the rest of the pattern and stockinette — the difference in my blocked swatch is at least 1/4 -3/8 inch per 3.25″ pattern repeat, which translates to 2-3 inches down the front of the sweater (plus the collar). I might be able to block out the difference, but that risks flattening out the broken garter rib texture, and maybe make the button bands ripple if I increase my pickup rate to compensate. A springier merino yarn might absorb the blocking we’ll, but the high BFL and longwool fiber content in this yarn doesn’t have that much give. I could loosen my gauge over the broken garter rib portion of the fabric, but that could encourage even more horizontal spread and leave the center fronts looking shapeless and messy. 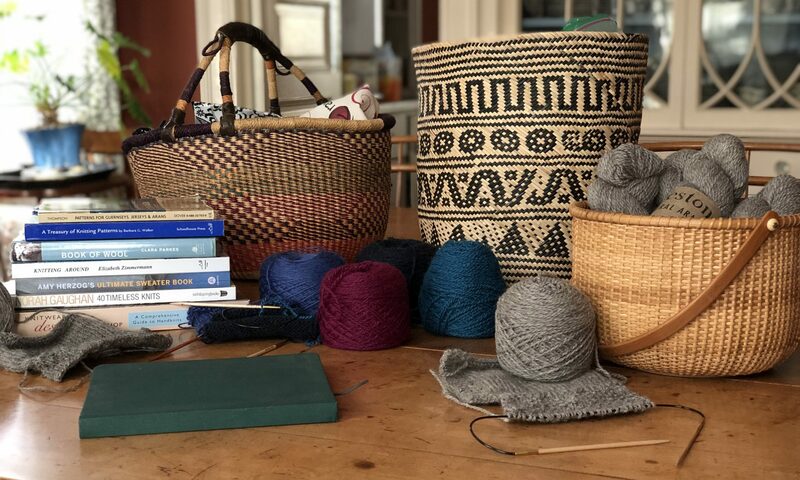 The solution I came up with is to add a pair of short rows once per zig zag repeat, adding two rows at the narrowest point of the 24-row repeat, tucking the wrapped stitch behind the zigzag crossover. 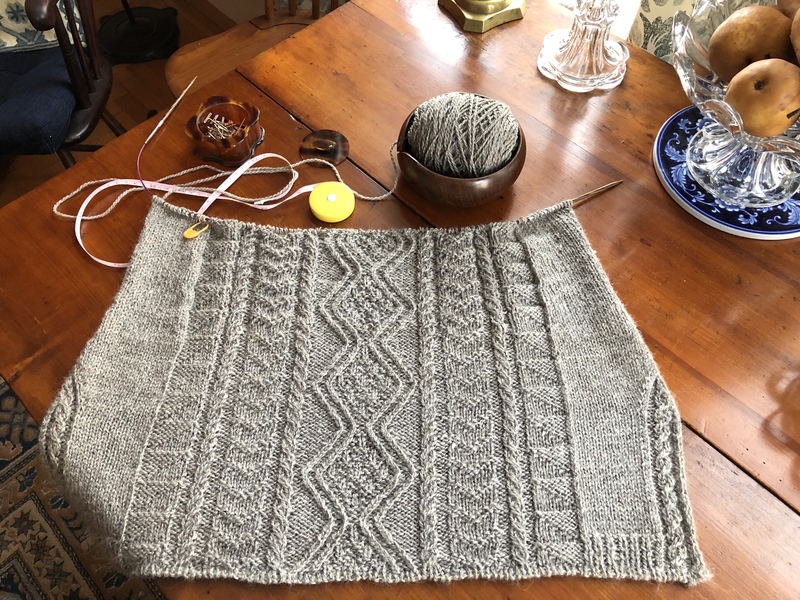 I’ll have to watch my progress carefully for the broken garter rib, as it has an 8- row repeat, and the short rows alter my zig-zag pattern repeat to 26 rows from 24. With all four patterns taken into account, my overall pattern repeat is now 104 rows instead of 24. 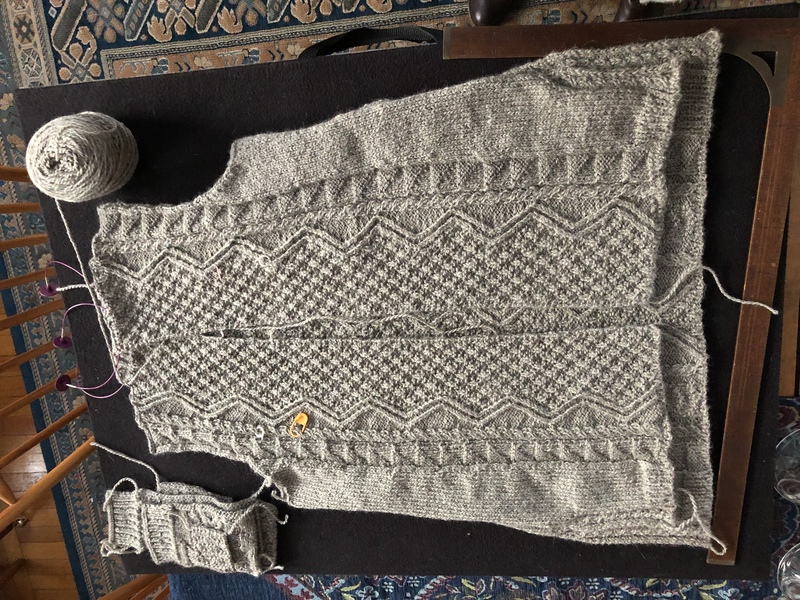 My stockinette gauge is is on target, my swatches tell me this will all come out in the wash and block phase, but for now, looking at the lower half of the back of my sweater is giving me palpitations over fit. It doesn’t look anywhere near wide enough, and especially with saddle shoulder construction, I won’t know for sure how it will fit until it’s too late to do anything but start over. 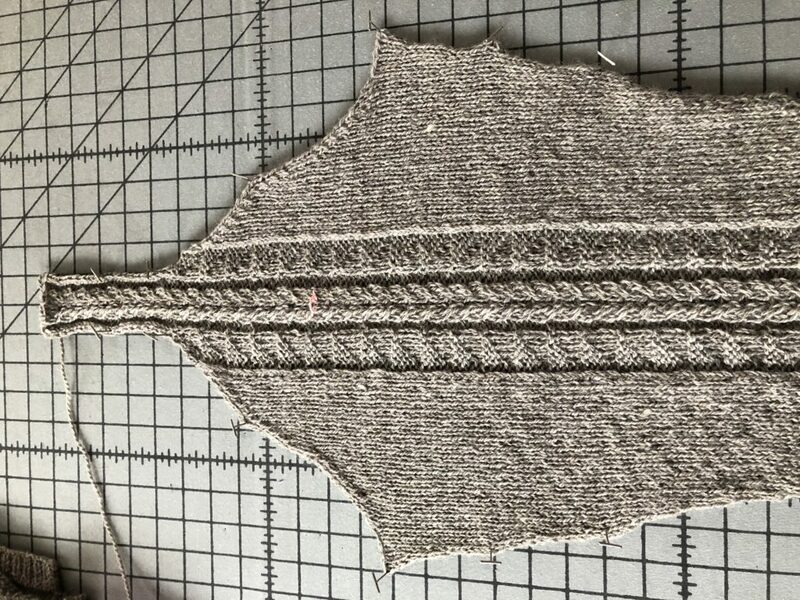 I know some knitters block pieces before seaming, but the argument that this risks stretching edge areas (like armholes) out of alignment, and setting them that way, has always made more sense to me. It’s cables, cables bunch, and my swatches relaxed and spread out after washing with no effort pin or block them, but still, I worry. Since the hem is vented, I think I’ll dip the portion below the seam in water tonight and make sure the fabric relaxes as expected.